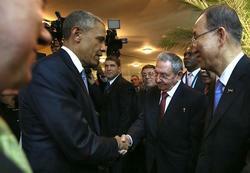 Equipo Nizkor - Handshake for Obama and Raúl Castro of Cuba. President Obama and President Raúl Castro of Cuba shook hands here on Friday night, and American officials said they would hold discussions on Saturday during a gathering of regional leaders, in the first full-fledged meeting between presidents of the United States and Cuba in more than a half-century. The expected encounter was not on Mr. Obama's official schedule, but it held deep significance for the regional meeting, as the president's move to ease tensions with Cuba has overshadowed the official agenda. Mr. Obama is nearing a decision on removing Cuba's three-decade-old designation as a state sponsor of terrorism, citing progress in the effort to re-establish diplomatic ties after half a century of hostilities. He spoke by telephone with Mr. Castro before the gathering, and on Thursday, Secretary of State John Kerry met with Bruno Rodríguez, the Cuban foreign minister -- the highest-level session between the governments in more than 50 years -- to lay the groundwork for the advancing reconciliation. The much-anticipated handshake on Friday night came as leaders gathered for a welcome dinner, where Mr. Obama and Mr. Castro were seated at the same table, separated by two other people. Before the official start of the summit meeting, Mr. Obama spoke at a civil society forum. "As we move toward the process of normalization, we'll have our differences government-to-government with Cuba on many issues, just as we differ at times with other nations within the Americas," he said. "There's nothing wrong with that, but I'm here to say that when we do speak out, we're going to do so because the United States of America does believe, and will always stand for, a certain set of universal values." The president rushed through a packed schedule on Friday as the summit meeting got underway, beginning his day with a tour of the Panama Canal. At a forum with business executives Mr. Obama promoted a $1 billion investment package he has proposed for Central America in an effort to address the causes of the surge of immigrants across America's southern border last summer. "The more we see our economies as mutually dependent rather than a zero-sum game, I think the more successful all of us will be," he said. Mr. Obama made it clear that he still had human rights concerns and was determined to discuss them openly. He held a lengthy meeting with civil society leaders from 12 other countries, including two from Cuba, after a speech at the forum in which he referred to the American civil rights and gay rights movements and to people who opposed apartheid in South Africa and Communism in the Soviet Union. "Civil society is the conscience of our countries," he said. Cuba is attending the Summit of the Americas for the first time since the meeting's inception in 1994. As senior Cuban and American officials spoke, people representing pro- and anti-Cuban government groups clashed for the third straight day on the sidelines, drawing a contrast with the diplomatic warming. Hours before Mr. Obama arrived to address the civil society forum at a hotel here, members of groups sent by the Cuban government tried to block access to dissidents, calling them mercenaries who did not speak for Cuba. At one point, amid angry chanting by the various groups, one of Cuba's best-known government opponents, Guillermo Farinas, was jostled and manhandled as he tried to pass through a crowd of pro-Castro demonstrators. "These aren't really dissidents, they aren't really interested in democracy and human rights," Patricia Flechilla, a Cuban student and delegate at the summit meeting, told reporters, going on to repeat a familiar complaint from the Cuban government that opponents are paid and propped up by foreign governments, namely the United States. The fracas interrupted the work of the forum, made up of nongovernmental groups from across the hemisphere, to produce a statement directed at the region's leaders. Later, before Mr. Obama arrived, scores of people waving Cuban flags and chanting "Long Live Fidel, Long Live Raúl" gathered outside the hotel. Santiago Canton, executive director of RFK Partners for Human Rights at the Robert F. Kennedy Center for Justice and Human Rights, said the presence of Cuba at the summit meeting would inevitably lead to discord that only highlighted the lack of democracy and human rights on the island. "People were sent by the Cuban government to disrupt everything going on, and they are doing that well," he said after observing the clash. "Human rights and democracy are weak points on the Cuban side." Representatives of the Cuban delegation said they would withdraw from the civil society forum rather than "share space with mercenaries."